Hot Spring Spas designs their hot tubs to provide an incredible massage experience. They utilize their exclusive Moto-Massage DX to offer advanced hydrotherapy. Consumers can choose between more than 10 different jets. 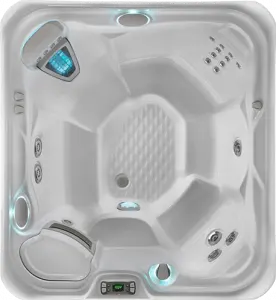 Hot Springs Spas has also created an Energy Smart system to make it easier to enjoy the many benefits of a hot tub without using a lot of energy. This makes their products more eco-friendly. 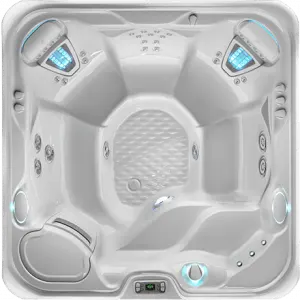 This technology earned Hot Spring Spas the ENVY award in 2008 for the best Energy Efficient Hot Tub Design. Hot Spring Spas offers multiple water systems to get their products clean, including the ACE Salt Water System. Hot Spring spas Vista is a 6 person hot tub. The Vista spa features two deep bucket seats and one deep sitting lounge for best relaxation. You can find the Hot Springs Spas Vista replacement hot tub cover here. This is the biggest hot tub that Hot Spring Spas makes the Grandee. 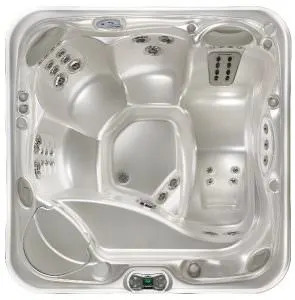 The five seat Envoy is a popular hot tub in the Hot Spring Spas line up. With one lounge and a deep corner seat. Aria is a five seater hot tub in the Hot Spring Spas line up. With one lounge and 3 deep seats. The Vanguard is a campfire like hot tub from Hot Springs with just surround seating and no lounge. 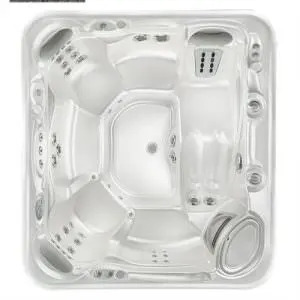 Sovereign hot tub from Hot Spring Spas is the five seater smaller tub that is great for a family. 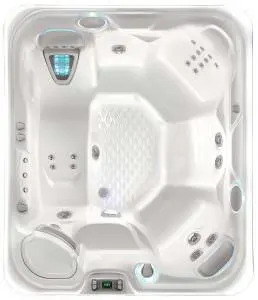 Hot Springs Spas Prodigy is a wonderful hot tub that sits five adults comfortably. 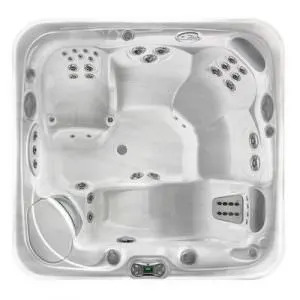 The Jetsetter is a Hot Spring Spa that sits three very comfortably. You can find Replacement hot tub covers for all Hot Spring Spas models here. “Summer Logic” occurs when the actual water temp for the spa climbs to 2°F (1°C) above set temperatures and is more likely in extremely hot weather. The condition causes the circulation pump to turn off automatically if it’s running in order to avoid adding additional heat to spa water that could cause “Overheat” conditions. This setting is not user-programmable. This condition does not kick in until the water temperature climbs to 95°F (35°C). The spa system’s ability to cool itself down is directly affected by ambient temperatures. Very hot summer ambient temperatures can prevent the spa unit from cooling because its insulated construction is designed to minimize operating costs and hold in heat. One of the sensors detected that the water in the hot tub is 112°F (44°C). Stands for “Overheat”- and the tub shuts down because water temp is too hot. Temperature is not safe. The circ. pump will stop functioning to reduce frictional heating when water temp reaches 2°F (1°C) more than the set temperature. DO NOT GET INTO THE WATER! Take off the spa cover to allow the water to cool down to fix the situation. Caution: Do not leave this cover off when children are present. 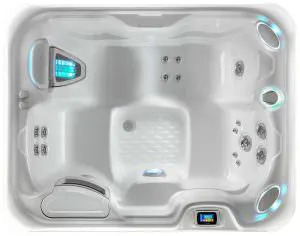 Shut the power down to the hot tub and contact the dealer or service technician if the problem continues. Stands for “Sensor 1” and displays when the high-limit sensor is malfunctioning. Indicates a shorted sensor and spa is shut down or an open sensor and heater is disabled. Contact dealer or a service technician. Stands for “Sensor 2” and displays when the temperature sensor is malfunctioning. Indicates a shorted sensor and the heater is disabled. Contact dealer or a service technician. breaker. Turning it on will reset cycle for the circulation pump. After the pump primes itself, the error message should go away. 5. Contact dealer or a service technician if problem continues. Occurs only in Economy mode and Indicates a cool condition where temps have dropped 20°F (11°C) below current settings for them. System activates the heater and jets pump 1 to bring temp within 15°F (8°C) of set temps. No action required, but during cold weather you may want to increase the amount of filtration cycles. This only occurs when spa is in Economy mode and stands for “Ice;” means the system has detected a potential condition for freezing and will cause the system to implement freeze protection to get the spa out of the danger zone. No action is needed. The main pump operates in this condition to circulate warm water throughout the plumbing until the unit is warmed up to 15°F (8°C) of the set temps. The water temp has raised above acceptable safety limits and triggered the safety “Watchdog” program of the spa system. Condition can cause injury or damage to spa and its components. The spa deactivates in this situation. DO NOT GET INTO THE WATER. Contact dealer or a service technician. Indicates that spa needs a new UV bulb. Purchase new UV bulb from dealer and reset countdown timer. Stands for “Overheat”- and the tub shuts down because one of the temperature sensors has detected that water temperatures have raised above acceptable safety limits. DO NOT GET INTO THE WATER! Take off the spa cover to allow the water to cool down to fix the situation. 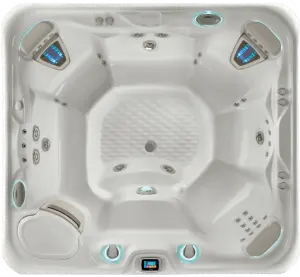 Shut the power down to the hot tub and contact the dealer or service technician if the problem continues. Potential freeze condition detected and the System activates the heater and jets pump # 1 for protection. It happens when the spa water is more than 19.4°F (-7°C) colder than temperature set points. The system stays in this mode until water temps rise to 59°F (15°C) below the set temperature. No corrective action needed. Stands for Flow Switch. Means that the flow switch is malfunctioning or the flow of water is being inhibited. The heater is deactivated and filter/circulation may be deactivated, also. Check for clogged filter and proper water levels in the hot tub. See pp 60-62 of owner’s manual to do this. Contact the dealer or service technician if the problem continues. *Note: You may see this message after the hot tub has been drained and refilled, and the pump has not regained its prime. See page 77 of the owner’s manual if this is the case. Circuit board temperature threshold has been exceeded. The message will go away once the board temperature cools down to acceptable limits. If you continue to see this message, provide shade for the portion of the hot tub that houses the equipment. A freeze condition has been detected by the system. The jet pumps operates until the water is warmed and spa is out of danger zone. No action is needed. Note that this message may occur when the hot tub is filled for the first time because tap water is usually very cold. PF Indicates a hot tub power failure. The power is fluctuating in the 2ndary power line resulting in low DC voltage. Attempt to rest the spa power, The PF error will reset itself if power levels return to normal. Contact the dealer or service technician if the problem continues. Indicates faulty communication between the spa’s control panel and circuit board and/or remote control panel. Contact the dealer or service technician. Stands for “Sensor 1” and displays when the high-limit sensor is malfunctioning. Indicates a shorted sensor and spa is shut down or an open sensor and heater is disabled. Contact the dealer or a service technician. Stands for “Sensor 3” and displays when the main water temperature sensor is shorted or disabled. The heater is disabled in this case. Contact the dealer or a service technician. Indicates that the flow switch is malfunctioning. The system is disabled in this case and system startup has shorted or has a closed flow switch in this situation. Contact the dealer or a service technician. One of the sensors detected that the water in the hot tub is 112°F (44°C). Stands for “Overheat”- and the water temperature is too hot. The low speed pump is actuated to circulate the water through the heater. DO NOT GET INTO THE WATER! The water temp has raised above acceptable safety limits and triggered the safety “Watchdog” program of the spa system. Condition can cause injury or damage to spa and its components. The spa deactivates in this situation. DO NOT GET INTO THE WATER! Contact dealer or a service technician.